PLANT CITY, Fla. — The Florida Strawberry Festival released the lineup of entertainers who will perform on the Wish Farms Soundstage in March 2019. The 11-day festival is set for February 28 to March 10 in Plant City. It celebrates the strawberry harvest of Eastern Hillsborough County. "The theme of this year's festival is It's A Hit' and I believe our guests will be impressed with the All-Star lineup we have this year!" Davis said. A lot of big names are set to perform. Old Dominion's Make It Sweet Tour will close out the much-anticipated festival. Advance tickets for admission and for headline entertainment shows will go on sale Thursday, Dec. 6, 2018 at 8 a.m. and can be purchased online , at the Amscot Main Ticket Office located at 2209 W. Oak Avenue in Plant City and over the phone at 813-754-1996. For more information about ADA accessible seating or tour group sales, call 813-719-6680. 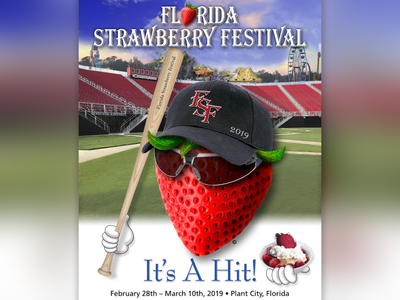 For more information about the 2019 Florida Strawberry Festival, click here .